I haven’t even been able to get to my quilting machine for most of the last week, but today I finally reached the bottom of the piles and started trying to catch back up on some quilting. This little cutie was a quickie. It was made by a young lady whose grandmother brought it to me to quilt. I think the quilter was in the 8-10 year old range, but I’m not positive. Freehand allover swirls (in lime green thread!) were easy to do and helped hide the little bit of waviness around the edges. It was actually pretty well pieced: I wish my first quilt had been that nice. There was Mark, taking off his work shirt, and there was the dog, wanting attention, and the next thing I knew, we were sticking her arms in the sleeves and I was running for the camera. 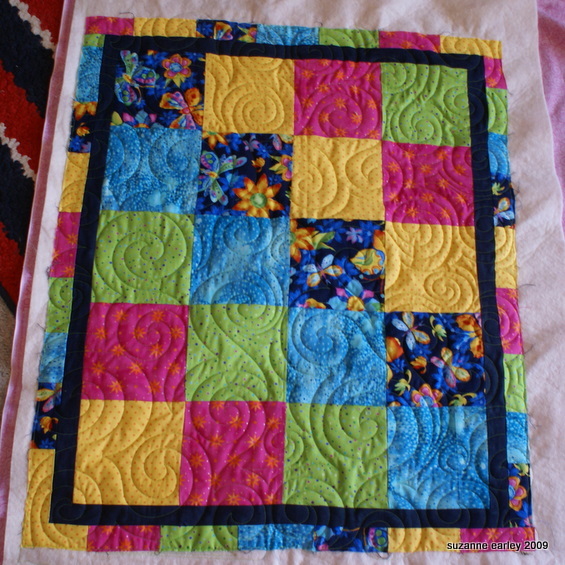 Love the quilting you did on her quilt, she is going to be thrilled. I love doing free motion and want to do more small quilts to practice designs. LOL LOL we used to do that to our dog all the time. good for laughter for hours. She sure is a good sport about it – but maybe she was willing to do anything for food!